It was another busy day of presentations – read on for some highlights! After dinner tonight the evening will be rounded off with Morten and his Dancing ‘Bots – controlling two robots in parallel. The 2D alternatives (Bubble chart, Contour plot) are generally more readable, because perspective can hide data in automated 3D charts. A very effective tool to explore the repartition of values amongst a un-modelled, yet categorised, numerical dataset. The registration packs that delegates received included a stick of rock and a rain poncho generously donated by Optima Systems. 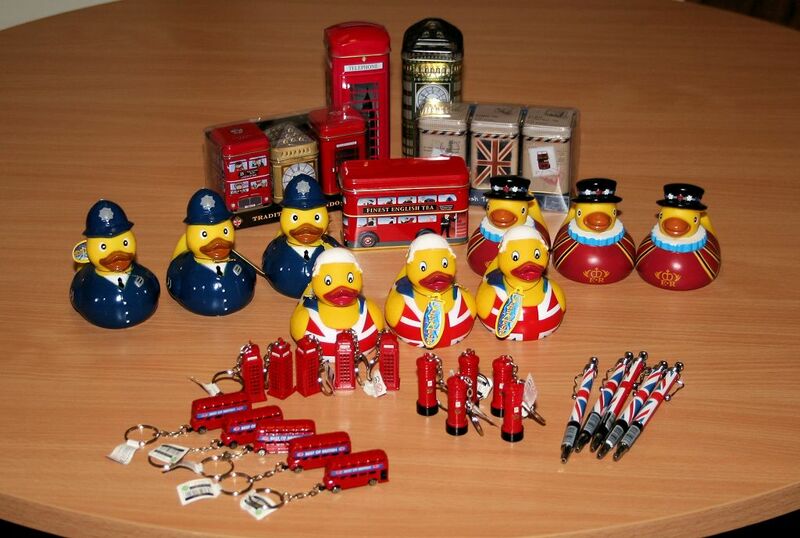 As these items were unfamiliar to many from overseas, Paul Grosvenor – Optima Systems’ Managing Director – modelled them for us. 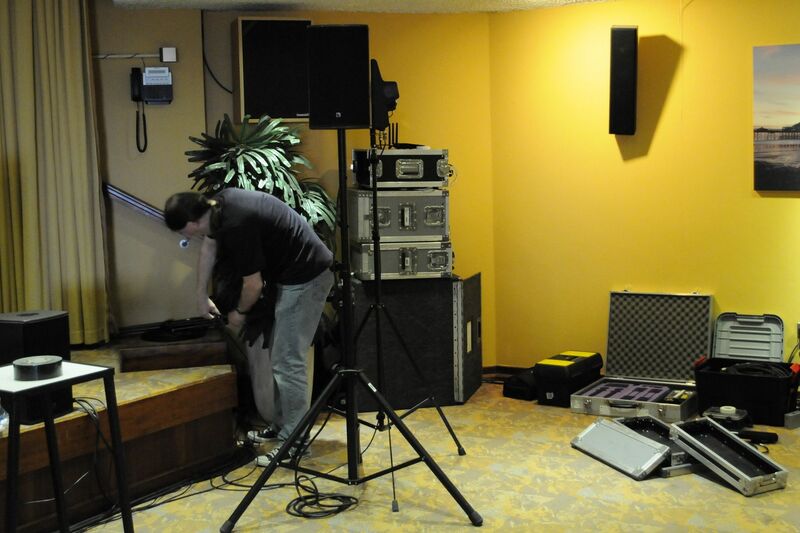 Behind each presentation at Dyalog ’14 is a team of people taking care – hopefully mostly unnoticed – of all the AV requirements. Jason and Jonathan are working full-time in the AV suite and they are being assisted by a rota of Dyalog staff and Liam Flanagan, who has temporarily returned to us for the event, as microphone runners and camera operators. 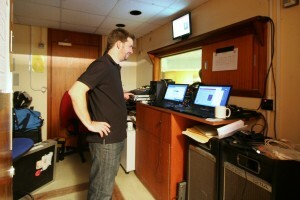 In total there are ten audio feeds and three video feeds, and every presentation is being recorded. 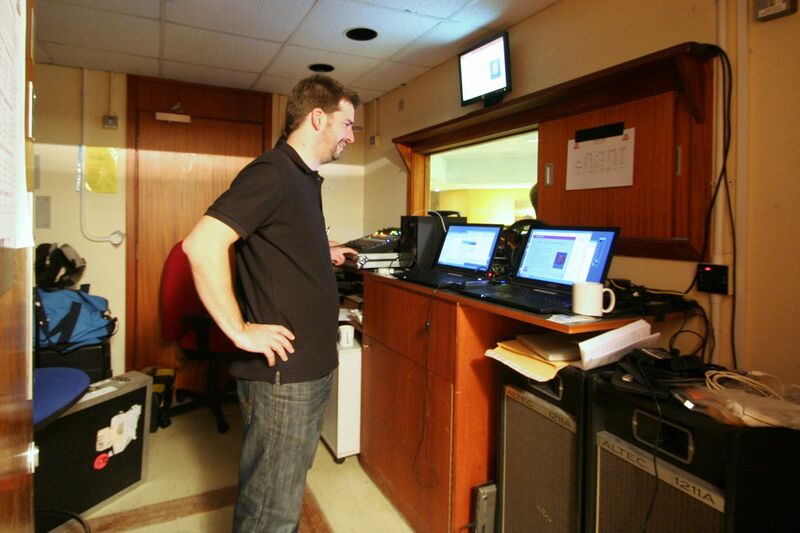 Generally, each presenter has different software and hardware needs and we allow everyone to use their own kit. In past years this has meant that changeovers have sometimes been less than seamless so this time we are experimenting with a system that allows one presenter’s equipment to be set up while the previous session is still taking place – this is giving a really noticeable speed-up in the changeover times. Over the coming weeks the recordings will be edited and released online. The presentations will be released at the rate of approximately two per week as each generally takes around six to eight hours to edit and needs to be reviewed and approved by the presenter. John Scholes and Geoff Streeter started writing the Dyalog APL interpreter this day in 1981? Tomorrow morning’s schedule includes two Dyalog and two user presentations. The afternoon will be dominated by the Viking Challenge (don’t forget to wear outdoor clothes and shoes that are suitable for walking!) followed by the prize ceremony for the International APL Programming Contest 2014. The two winners (one student and, for the first time, one non-student) will talk about how they achieved their victory. Everyone is encouraged to give this next generation of APLers their full support. The banquet will round off the day. After having spent yesterday in workshops with lots of hands-on examples, today was the kick off for the user meeting proper. The last time Dyalog held a global user meeting in the UK was in 2003, and 2014 has given us an all-time record attendance in terms of delegates. 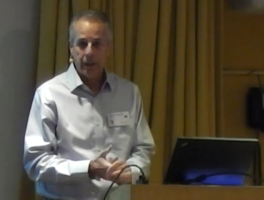 My posts from Dyalog ’14 will focus on extracts from User Presentations, and the first presentation I would like to highlight is There’s DNA Everywhere – an Opportunity for APL by Charles Brenner PhD (http://dna-view.com). Charles describes himself as consulting in forensic mathematics and his DNA-View software programme is used by 100 laboratories in every continent (except Antarctica) for academic activities in mathematics, biostatistics and various aspects of population genetics. Elegance and simplicity lead to several concrete benefits. The first is conceptual development. “I made notes in APL as solutions to various aspects of the problem occurred to me last year. These brief APL notes ensured that the ideas really made sense, that they worked together and that I would not forget them. The brevity also revealed a simple but important point that others had overlooked: nesting the computation loops in the right order saves orders of magnitude in computation time. For another, execution speed makes it much easier to see the forest in many ways – testing, developing, designing. Competing programs take hours to find a partial answer, then having worked that hard succumb to a natural tendency to call it a day. The APL “DNA-VIEW Mixture Solution” program does the same in seconds, which makes it much easier to think through to the fact that there’s a lot more work to do before the result is logically defensible.” Charles explained. At the end of 2013 Charles implemented the Mixture Solution and tested it on examples including a set of five proficiency exercises created at the National Institute of Standards and Technology. 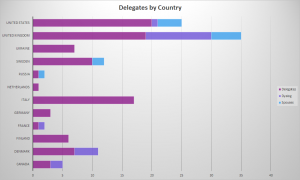 More than one hundred entrants, including the leading competition, had contributed analyses. One of the competitors (supported by years and millions of dollars of government grants) got four problems right and came close on the fifth, viewing it as a three person mixture although in fact it was four. Mixture Solution alone correctly analysed all five – as a bonus it correctly diagnosed one suspect as a mixed race person. “We APLers try to be modest but it’s not always easy. Sometimes there’s just not much to be modest about!” Charles stated. 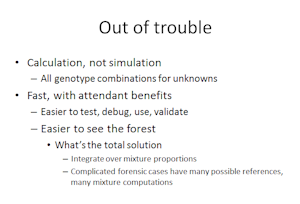 Having now reached a point where he has developed a superior, fast, elegant software solution to a massively complex DNA Mixture analysis problem, Charles ended the presentation with a plea for help. 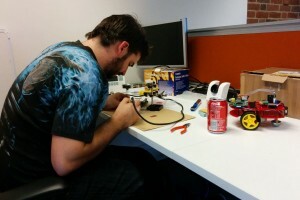 First and foremost he is looking for someone who can help carry on with the further software development using Dyalog. This could be a fantastic opportunity for someone with an interest in forensics, maths, computer science and software programming in Dyalog – “living in the Bay area”. The Finnish Pension System is currently undergoing a reform and there is a strong need to microsimulate various parameters to help make decisions regarding future pension schemes. 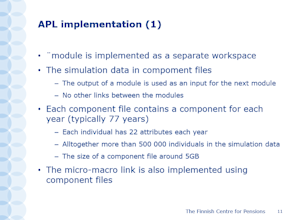 Heikki Tikanmäki from the Finnish Centre for Pensions gave us a presentation of ELSI – the Pension microsimulation model that has been built in the Finnish Centre for Pensions using Dyalog. ELSI models the statutory pension system of Finland. It is used for reform analysis and long-term projections. In a typical simulation run, they model 500,000 individuals over 70 years. By using Dyalog not only do they retain compatibility with older macromodels, population and employment projections, they also gain flexibility for modelling various proposals for a new pension scheme. The model is built in modules with each module running as independently as possible. All the simulation data are held in component files. Depending on the complexity of each module, it takes 10-40 minutes to run using version 12.1 – without doing any performance optimisation. Heikki told us that by upgrading to Dyalog version 14.0 the model runs 20% faster and the simulation data are now only taking up 16% space in comparison to the 5 GB size they previously had. 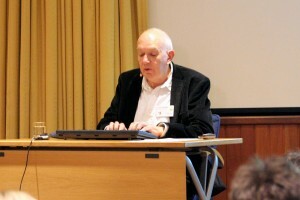 Future plans include implementing the use of parallel processors for the computational tasks in ELSI, and at that point in time he expects at least a further 50% reduction in the time it takes to run the entire microsimulation model. Monday opened with registration for what is the biggest Dyalog user meeting on record – it could have been even bigger but we had to turn some people away because there was no more room available. In total there are 126 attendees (even more that when we went to print with the programme!) 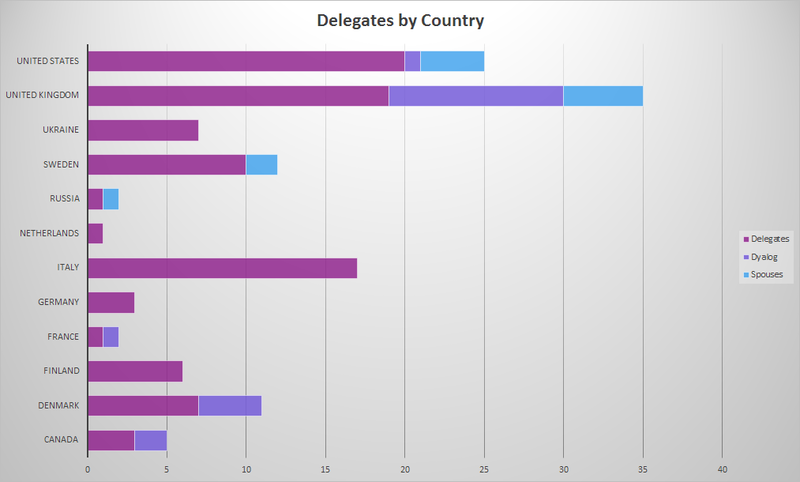 made up from 95 delegates, 12 spouses and partners, and 19 Dyalog employees from around the world as shown. Charles Brenner performs forensic analysis of DNA and DNA mixtures – an intensive mathematical process. 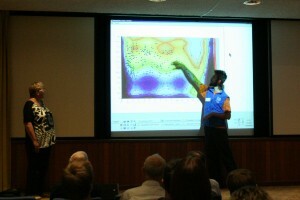 Others use complicated statistical and Monte Carlo methods but by using APL as his tool of thought, Charles has devised techniques which are more accurate and many times faster than competing applications supported by multi-million dollar funding. In today’s session “The Tuning Pipeline”, Roger Hui noted that for the index-of family of functions, a faster algorithm is often possible if the left and right arguments are “the same”, up to a factor of two. “The same” means the that the values have identical references so that they can be compared with a simple and quick check. For example, x⍳x is a selfie but x⍳0+x or x⍳(⍴x)⍴x are not. Selfies occur in less obvious places – when finding uniques (∪x), in the key operator, and in x∧.=⍉y as well as in x⍳x and ⍳⍨x. You can try this yourself for various datatypes. A selfie which is not faster is an opportunity for a performance improvement. 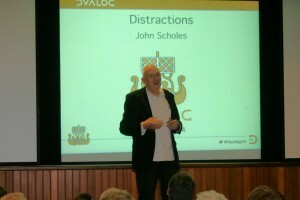 An awed silence gripped the room as John unveiled ground-breaking techniques for minimising life’s distractions and maximising programming productivity. It is too early to say how far-reaching this approach will turn out be in real life situations and whether it will affect The Global Economy as a whole. John appeared to have all categories of distraction covered. Let’s see. Like Woodstock ’69 and The Isle of Wight ’70, in years to come you may be able to say “I was there”. Tomorrow’s schedule features five user presentations and four Dyalog presentations covering the themes of code management and reuse, performance, presentation tools and cryptography. In the evening Morten will demonstrate the progress he has made with the ‘bots (something that should be very familiar to regular readers of the Dyalog blog!). 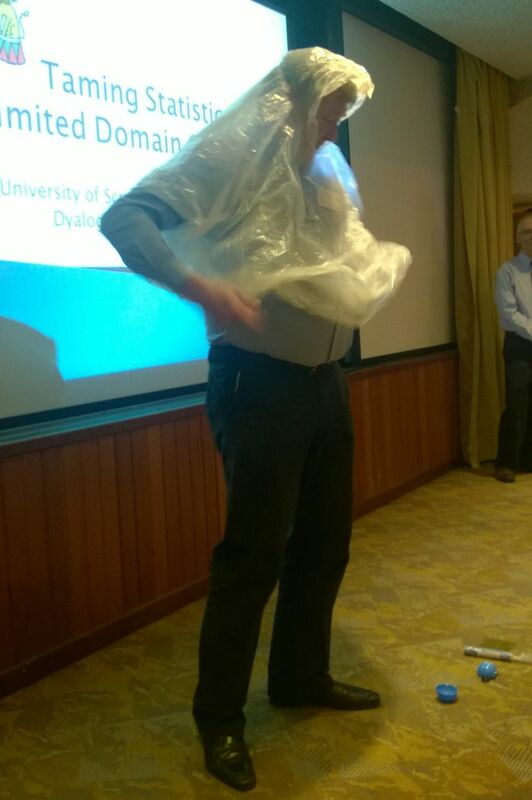 Today at Dyalog ’14 was a day of Technical Workshops: six half-day sessions and one all-day session were held, and there will be more at the end of the user meeting on Thursday. This evening Gitte will informally welcome the attendees before Vibeke introduces the scavenger hunt and Karen and Jason run a traditional English pub quiz so that delegates can get to know each other and the host country a bit more. This year we plan to keep you more up to date than ever before with what is happening at the user meeting. Programme updates and supporting materials will be made available on our website. There will be blog posts each day and we are using the Twitter hashtag #dyalog14 on our tweets – we encourage everyone to join in with us whether in Eastbourne or not. 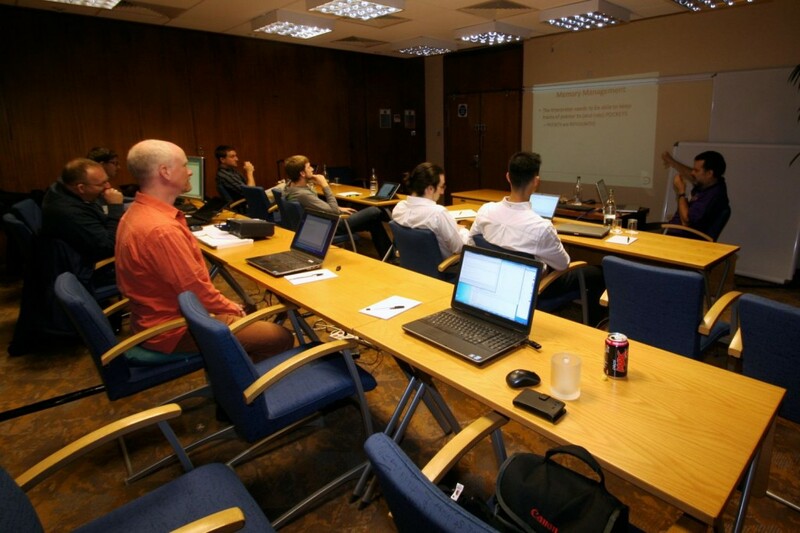 For Team Dyalog, the start of the user meeting is the culmination of preparations spanning weeks or even months. There have been some obstacles along the way – not least the fire on the pier, which meant a replacement banquet dinner venue had to be hastily found – but the presentations are ready and everything kicks off in the morning. We are looking forward to a busy but enjoyable week! Dyalog ’14 formally begins tomorrow. We expect a busy day commencing with registration and followed by ten presentations in total, starting with a formal welcome from Gitte. As has become the custom, there will be a mixture of presentations from Dyalog Ltd, guests and invited speakers throughout the week. Monday traditionally features Dyalog presentations and this year is no exception – but we will also have Charles Bremner and Heikki Tikanmäki talking about forensic DNA analysis and pension modelling respectively. Two years ago, by popular request, we abandoned the practice of running presentations in parallel (extending the programme by a day to allow this) and all of the presentations will run sequentially again this year. There are planned evening activities for each of the conference nights. 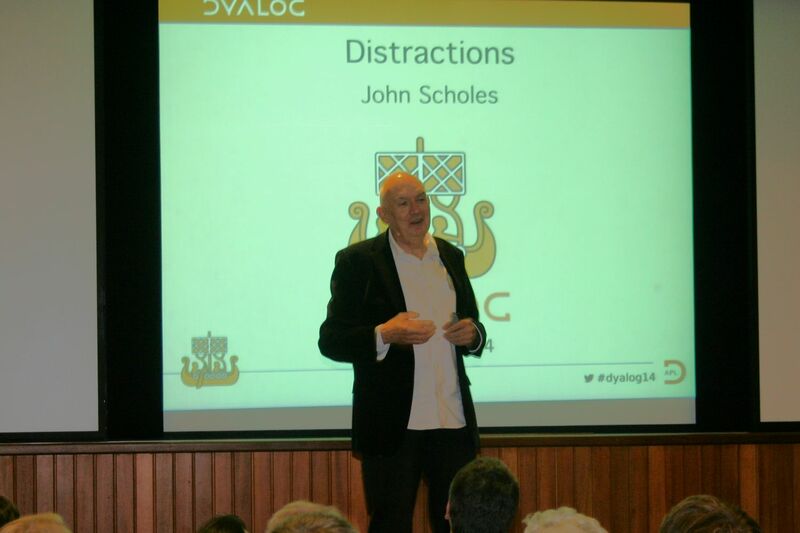 After dinner tomorrow, John Scholes will present his observations on the subject of “distractions” – those who have attended his evening presentations before will know they can be highly entertaining! 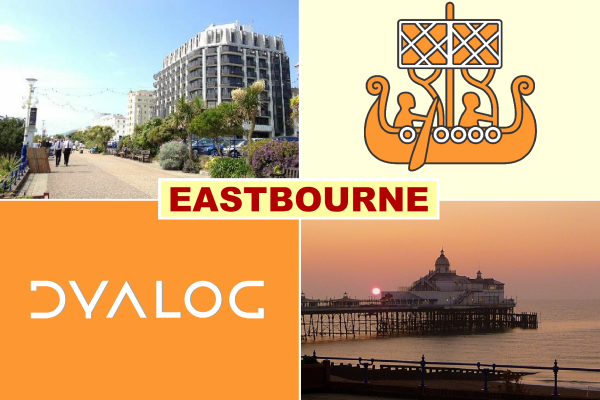 Welcome to the first of several postcards from Dyalog ’14 in Eastbourne. The last Dyalog conference/user meeting held in the United Kingdom was at Horsley near Guildford back in 2003 and we’re looking forward to holding it on what is, for a lot of us, home ground. 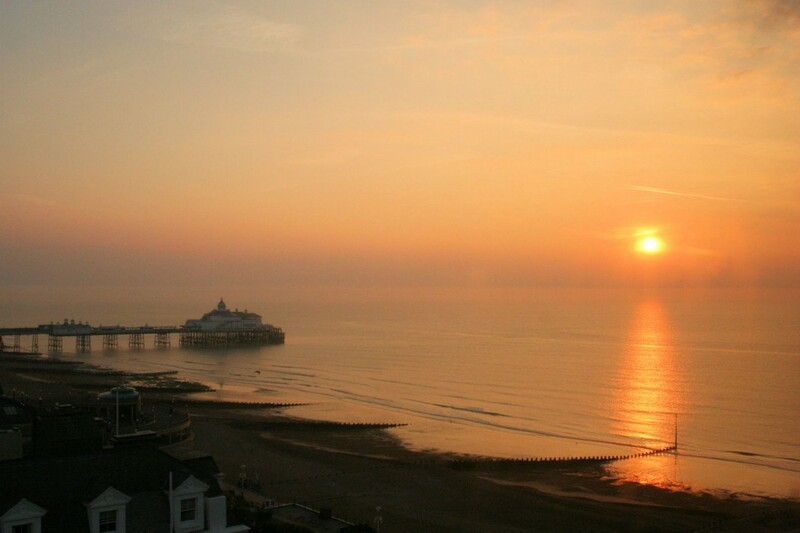 Eastbourne is a resort on England’s south coast known for its promenade and pier (of which more later! ), its hotels, guest houses and, by no means least, its conference centres. As a bonus, we should see some decent seaside weather – we can’t promise the Florida sunshine of Dyalog ’13 but the UK is currently having a much better than average late summer; the weather forecasters say it should continue and that we’re heading for one of the driest Septembers on record so let’s hope they’ve got it right! All but four Dyalog staff have come to Eastbourne. We’re looking forward to sharing what we’ve been working on, listening to our users’ presentations and meeting attendees old and new – this is set to be the biggest conference we have ever held with 126 registrations in total (two more than it says in the programme due to two last-minute registrations after we went to press!). 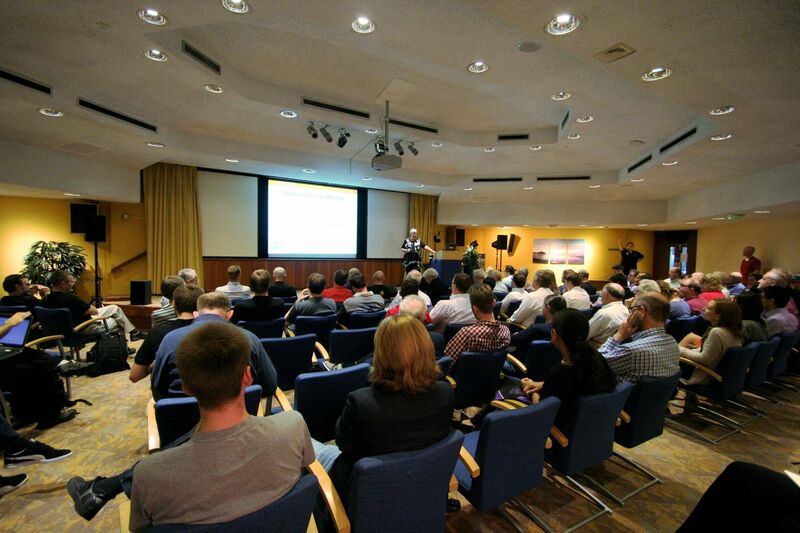 The programme kicks off tomorrow with Technical Workshops all day followed by three and a half days of presentations by Dyalog staff, users and invited guests, finishing on Thursday afternoon with the remaining Technical Workshops. We’ll report on some of the highlights of these presentations over the coming week. We’re making recordings of all the presentations and some of the workshops, and will be putting them all up on the Dyalog website over the coming weeks. We do, of course, also have our “Viking Challenge” on Wednesday as well as daily evening entertainment, culminating in the banquet on Wednesday night. 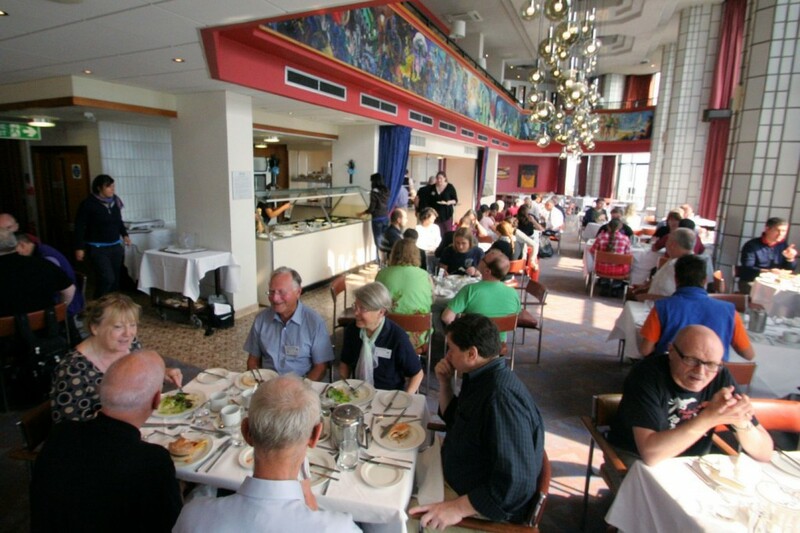 Originally we had the dining suite at the end of Eastbourne Pier booked for the banquet, but, as you may have seen, Eastbourne Pier suffered a major fire at the end of July and is now closed for rebuilding. Fortunately we have been able to secure The Grand Hotel as an alternate venue, and all is back on track. All in all we anticipate a very busy – but enjoyable and productive – week and hope to summarise the essence of it here; check back daily for reports of events!